The pomegranate is a fruit that comes from the pomegranate, a decorative tree and easy to find in orchards and Mediterranean gardens, begin to be harvested at the end of September when the fruit is in full maturity. It has a thick skin, is completely edible and is characterised by a refreshing, bittersweet flavour. It has reddish, yellow and greenish tones, which stores a multitude of seeds known as arils. It is recognized both for its taste and for the nutritional properties it offers, being considered in antiquity a symbol of love and fertility. Granada Mollar de Elche: The most popular in the region and for which the country is recognized internationally. It is characterized by an intense sweet taste and soft pulp. While its color and aroma is less intense. It weighs approximately 800 g.
Granada Mollar Valenciana: With a sweet taste and cultivated in Valencia, this pomegranate has a light pink colour inside and an intense pink inside. It is resistant to manipulation and is harvested at the end of August. Its weight does not exceed 400 g.
Granada Wonderful: Harvested worldwide, are of medium or very large sizes, have an intense red color, both inside and outside, is distinguished by having round shape and crown elongated. 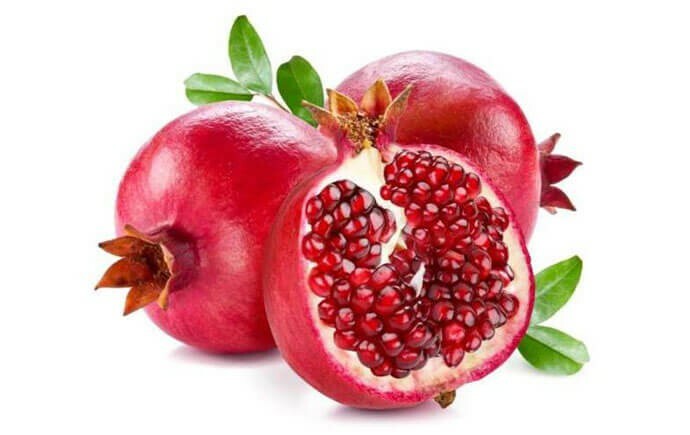 Its maximum weight is 800 g.
The biggest pomegranates are usually the sweetest. The weight indicates its maturity and quantity of juice. Your skin should be shiny and reddish. Avoid those that have blows and cracks. Try to feel their aroma. You can use them for: natural consumption, juices or making confectionery syrups. Minerals such as potassium, manganese, calcium, iron, phosphorus, sodium, zinc, copper, selenium and magnesium. A large amount of vitamins: C, B1, B2, B3, B5, B6, E and K.
It has antioxidants such as beta-carotene. Being composed of a high water content, provide protein and fat in low amounts. It lowers blood pressure. It contains polyphenols, which reduce levels of bad cholesterol and triglycerides in the blood. It cleans the kidneys. Due to its high content of minerals such as potassium, iron, zinc and calcium, helps to purify this organ, improving the functioning of the body. It improves physical performance and avoids fatigue. It has large amounts of nitrates, causing positive effects on the circulatory system, for better performance and delay of fatigue. We recommend that 30 minutes before starting your exercise routine you drink a little pomegranate juice, in a short time you will notice the difference. It treats arthritis and osteoarthritis. Its vitamins and anti-inflammatory properties block the activity of enzymes that damage the joints, so it serves as a natural remedy against this disease. It protects the skin. As it contains vitamins C and B12, it helps to regenerate the dermis and combat the negative results of UV rays. Anti-anemic. As it has vitamin C and copper, it facilitates the absorption of iron in the body. A current way to market pomegranates in Valencia is through the internet, with Naranjass.com you can place small and large orders, from the comfort of your home, without having to go to the supermarket. Since it is harvested in autumn, the fruit remains in perfect condition until January, without losing its nutritional qualities. In addition, thanks to the care we give when harvesting, collecting and distributing them, we ensure a satisfactory purchase and quick delivery. If you want to benefit from all its properties and make this fruit part of your diet, order online and we will bring the freshest pomegranates to your table!